eCrime 2019 consists of a 4 day program. One day of Workshops and CTF followed by 3 days of keynote presentations, technical and practical sessions, and interactive panels. An overarching goal of these meetings is bringing together academic researchers, industry security practitioners, and law enforcement to discuss and exchange ideas, experiences and lessons learnt combating cybecrime. The conference offers travel grants to students of accepted work who are having issues finding the funding to attend. Note that there is a set final date for requesting the stipend, please get your requests in as soon as possible after hearing back about your paper’s acceptance. 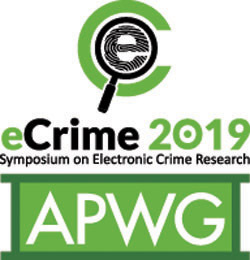 eCrime 2019 also has a best paper and runner-up award that is accompanied by a cash reward for the top papers submitted. Papers publication details will be posted soon. Cash awards will be given for the best paper overall and the honorable mention student co-authored papers. Authors of accepted papers must guarantee that their paper will be presented at the conference. A limited number of stipends are available to those unable to obtain funding to attend the conference. Students whose papers are accepted and who will present the paper themselves are given priority to receive such assistance. Requests for stipends should be addressed to the general chair after paper acceptance. Markus Jakobsson, Amber Solutions Inc.